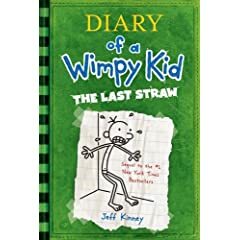 In the event you are waiting for the third book in the very entertaining bestselling series Diary of a Wimpy Kid, titled The Last Straw, the release date is January 17, 2009. … Let’s face it: Greg Heffley will never change his wimpy ways. Somebody just needs to explain that to Greg’s father. You see, Frank Heffley actually thinks he can get his son to toughen up, and he enlists Greg in organized sports and other “manly” endeavors. Of course, Greg is able to easily sidestep his father’s efforts to change him. But when Greg’s dad threatens to send him to military academy, Greg realizes he has to shape up . . . or get shipped out. Now of course if you can’t wait that long, October 15, 2008, is the release date for Diary of a Wimpy Kid Do-It-Yourself Diary – a perfect companion to the series. It is a fun interactive ‘journal’ that uses the same amusing humor as the books. The journal is filled with comics, fun personal trivia questions, and plenty of blank spaces enabling kids to have their own say. I see this journal as a very clever way to inspire children to do some reading with out even realizing they are in fact reading. I would even go as far as to say it is quite thought provoking, it encourages children to talk about themselves, complete and write their own comics, and document favorite and not so favorite things. Book 3 has a cover! – a post by Jeff Kinney at Diary of a Wimpy Kid Blog. Review of the Day: Diary of a Wimpy Kid – a post by A Fuse #8 Production.